Spring has finally arrived and although the sun is up and shining, the temperatures are not there yet as the cold winds keep it at a cool 15 degrees. Here at Saint Christopher’s, we have already organised our schedule and got outside to do some very much needed gardening. We worked like busy bees cleaning branches, grating dead leaves, sweeping the alleys and preparing the soil for new plants and fragrant flowers. The garden is the place to be, a spot where many stories were told along the years, plans were made, where everyone relaxes and forgets about their worries. Here, our young people understand how to behave, how to treat others, how to help and be proactive. The garden is a welcoming place and every year, spring cleaning reunites our happy troops in doing something to please the eye and the heart. 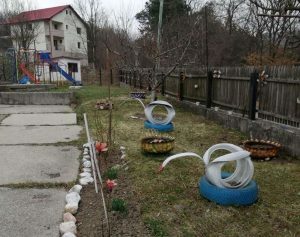 The children usually play around, laugh a lot, while they prune branches, plant flowers and decorate the garden with objects made by their own hands using recycled materials. Their ideas to beautify the yard finally came to fruition and at the end of the day they could admire their entire handy work. The garden is clean, the alleys are swept, and the entire courtyard is in order and ready to welcome them every day. Spending time outside participating in group activities developed by our specialists is one of the children’s favourite past time and they wouldn’t replace it for the world. We are happy the seasons are changing and that they will be able to create more positive memories here at the centre.